The first discovery of gold on the Swift River was made in 1849 near Byron, Maine. Over the years, quite a bit of gold has been mined from the river gravels, and it can still be found today. Although commercial gold mining is no longer active here, gold mining along the river still make a lot of contribution to the local economy. This is a very popular place for residents of Maine to try panning gold along the river and it is a popular destination from visitors all throughout New England. 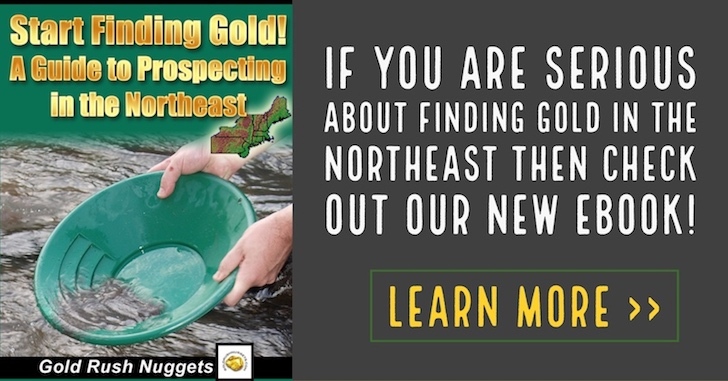 With more and more people taking to the sport of recreational gold panning, this river gives one of the best opportunities for striking gold in Maine. In fact, the Swift River might be the best river in the Northeast to pan for gold today. The source of the river is the Swift River Pond just west of Horn Hill in Franklin County. Its major tributaries of this gold-bearing river include Berdeen Stream along with the East and West branches of the river. The Swift River runs through the towns of Byron, Hale, Roxbury, Coos Canyon and inevitably streams into the Androscoggin River. Gold is found in many places, but since many areas along the river are private property you need to make sure you are in an area that you are allowed to prospect. Make sure you have gotten permission to pan. There are quite a number of beautiful places with proven gold presence along the river that you can pan for gold. The best-known location is at Coos Canyon located on Highway 17 in Byron. This is an excellent place to prospect for gold because Coos Canyon consistently produces good “color” for persistent gold panners. It is believed that the river flows over a yet to be discovered gold vain from one of the souring mountains. No major hard rock sources have been identified around the Swift River, but due to the high number of large gold nuggets that have been found along the river over the years it is highly likely that there is a lode source somewhere in the surrounding mountains. The sizable gold nuggets that have been found here are a big attraction to gold prospectors in Maine. Regularly, groups of gold panners explore the banks of the Swift River, with a hopes of finding gold. More gold panning enthusiasts have recorded success when panning for gold, although these days large nuggets are quite a rare occurrence. Most of the gold found in the gravel is quite small. Gold can be found all through the Swift River, but don’t overlook the tributaries that flow into it. Occurrences of fine gold deposits have been noted in other nearby streams as well. Albeit the fact that most of the gold found along the river is fine, the Swift River is one of the areas in Maine where you have a plausibility of finding some decent pieces of gold. There have been a quite a number of huge gold nuggets discovered in the Swift River before, especially along the main river and in both the West and East Branches. In fact, there is a popular gold panning site on the east branch of Swift River close to Byron that has recorded large gold nuggets before. The sight is owned by the Boise Cascade Corporation and you need to get permission from the timber manager before you start your gold panning. You can also buy mining tools from the nearby gift shop. This is a beautiful part of Maine, and you will also have an opportunity to picnic along the river, swim, fish, hike along the river, or just enjoy the beauty of the surrounding environment.